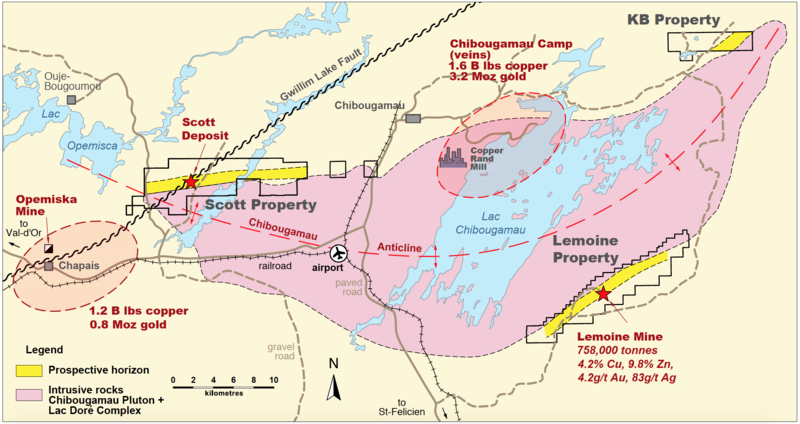 The Lemoine project, located 25 km south of Chibougamau, encloses the former producing Lemoine Mine which produced 0.76Mt of high grade massive sulphide ore (>$600/t at today’s prices). With grades of 4.2% Cu, 9.6% Zn, 4.2 g/t Au and 83 g/t Ag, Lemoine ranks number 2 in Canada (second only to Eskay Creek) and is within the top 1% of all VMS worldwide. The property encloses a 17 km segment of the favourable horizon hosting the deposit (Waconichi formation). The property is located just south of, and adjacent to BlackRock Metals Fe-Ti-V mining project. 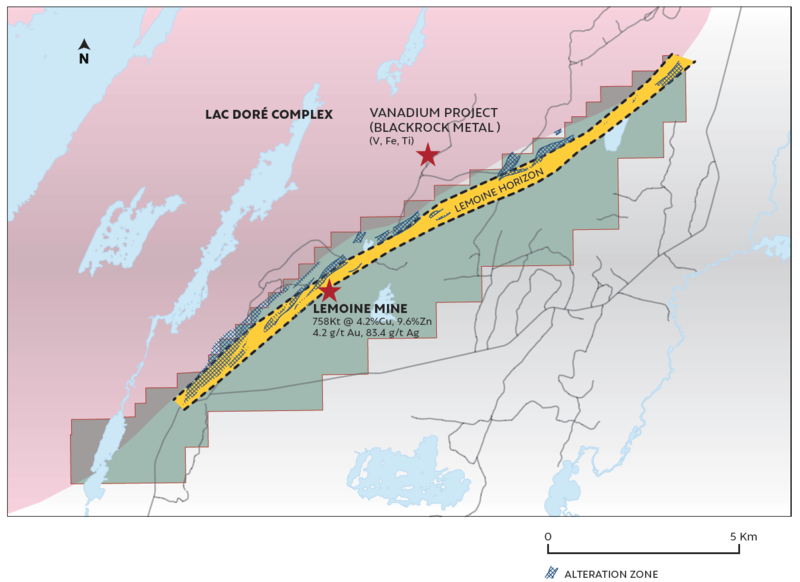 The Lemoine deposit was closed off by drilling below 400 metres vertical. However, the Lemoine horizon still remains wide open at depths greater than 700 metres down dip and to the west of the mined out deposit. In addition, the deepest hole drilled from underground in this sector (hole 12L-27) returned a high grade massive sulphide intersection of 43 cm grading 4.3% Cu, 6.3% Zn and 1.1 g/t Au. This intersection was partly followed-up down-dip in 2013 by deepening hole LEM-63 to 1,200 metres. The Lemoine horizon was intersected approximately 200 metres down-dip of hole 12L-27 with no significant mineralization but strong nearby conductors were identified by borehole geophysics along two mineralized horizons. The conductors need to be modeled in order to plan follow-up drilling. While the depths of the targets may reach 1,000 metres, the historical grades at Lemoine and the presence of a 400 metre deep shaft are economic factors that justify pursuing efforts in the area. Although First Quantum (formerly Inmet) retains a joint venture interest in the project, it has so far declined to participate in all programs since the JV was formed and, as a result, its interest has been reduced to about 20%.